There’s a lot of talk about equality these days, and with good reason. Exclusion is on the rise. People are being left out. Groups are ignored. It’s no wonder that the mega, multi-national consumer goods corporation P&G started a #WeSeeEqual campaign, a push well-timed in today’s society of #MeToo and #TimesUp. The campaign aims for a world free of gender bias that offers equal representation and voices for both women and men. It’s a powerful message that deserves praise and attention. Frankly, it’s hard to argue with or dispute any of its pleas. You can debate a lot of things in life, but equality isn’t one of them – it’s necessary and needed in a world filled with exclusion. But the campaign runs a bit contradictory when compared to another P&G effort, “Thank You Mom,” which resurfaces during each Olympics, as it did again during last month’s Winter Games. In it, we see an effort aimed at celebrating just one half of the parenting duo. Imagine what sports-loving dads were thinking when they watched regular nightly exclusion during the 17-day PyeongChang Games, as only mothers were thanked for helping athletes achieve their dreams. Meanwhile, these same dads would simultaneously encounter the #WeSeeEqual declaration, and another occasional P&G effort, #LoveOverBias – both exhorting humanity to treat everyone equally. Everyone, that is, except customers. These conflicting messages aren’t just confusing, they’re actually illogical; it’s impossible to pair the word “equality” with brands that concurrently exclude fathers, but P&G has indeed done the impossible. Media writers have praised the effort of #WeSeeEqual – and rightly so. On its own, it’s an incredibly commendable campaign and well-executed. But there’s no denying the mixed message it sends to dads and the parenting community. If equality is going to mean something, the corporate world needs a genuine effort with a real, authentic backing – in word and in deed. Otherwise a company is just selling products on a shelf, not a mission. I don’t watch much TV, but I did see an interesting commercial during the Olympics, and you probably did, too. There’s a Cover Girl ad which involves some major female celebrities exclaiming “Girls Can’t” — do this and that. Of course, we all know girls/women can do absolutely anything, so you have to figure there’s something more to see. It compels you to watch. Well done, Cover Girl. I liked it. But apparently men, specifically dads, cannot do everything. And that everything involves activities and games with their children. Who says so? Kellogg’s says so. Sure, it’s rather inconspicuous on the package, but as anyone in a relationship will tell you, it’s the little things that count. So, Kellogg’s, please don’t be like all the other cereal companies. (And believe me, there’s more to explore.) 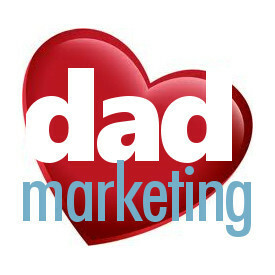 See what you can do about keeping dads an important part of your marketing mix. The Olympics are supposed to be a sporting competition of the greatest athletes in the world. So why, then, is NBC using the opening of its telecast each evening to remind us of human rights issues that have nothing to do with sports? Why can’t they just cover, um, sports? It’s about as unrelated as Proctor & Gamble creating the perception that moms are solely responsible for creating Olympic athletes. Once again, we here at dadmarketing believe that moms do indeed have a part in raising kids and encouraging them through the thrill of victory and the agony of defeat. But what about dads? In P&G’s world, dads flat-out don’t exist. Why can’t dads get equal love from P&G? What if dads orchestrated a boycott of their products? There’s a real boycott I’d love to see.